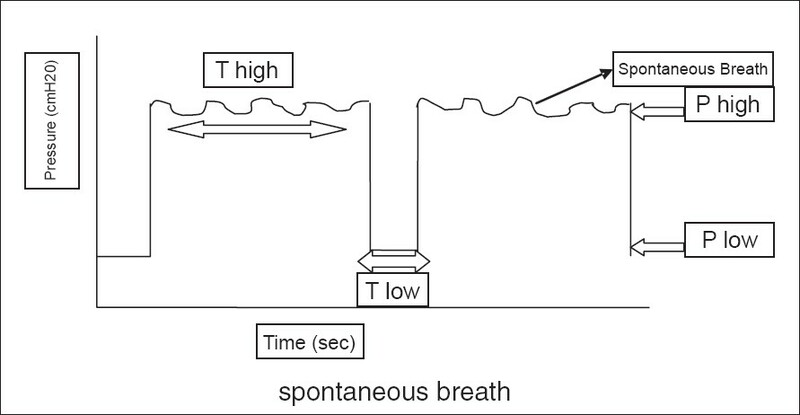 Background : Esophageal Doppler monitoring (EDM) is utilized in numerous clinical settings. This study examines the relationship between pulmonary artery catheter (PAC) and EDM-derived hemodynamic parameters, concentrating on gender- and age-related EDM measurement biases. Materials and Methods : Prospective study of EDM use in ventilated surgical ICU patients. Parameters examined included demographics, diagnosis, resuscitation endpoints, cardiac output (CO) and stroke volume from both devices, number of personnel and time needed to place equipment, time to data acquisition, duration of use, complications of placement. Results : Fifteen patients (11 men, 4 women, mean age 47 years) were included. Most common diagnoses included trauma (7/15) and sepsis (4/15). Insertion time and time to data acquisition were shorter for EDM than for PAC ( P <0.001). The EDM required an average of 1.1 persons to place (2.4 for PAC, P =0.002). Mean EDM utilization time was 12.4 h. There was a fair CO correlation between EDM and PAC (r = 0.647, P <0.001). 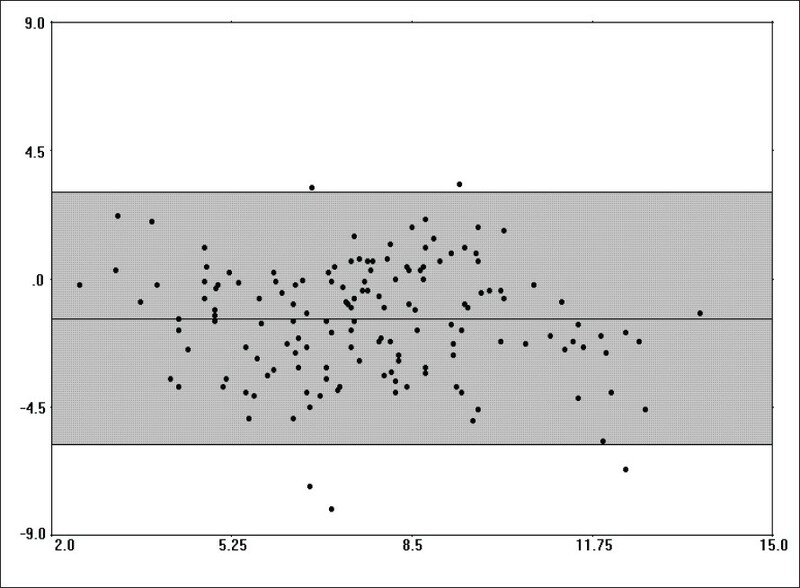 Overall, the EDM underestimated CO relative to PAC (bias -1.42 ± 2.08, 95% CI: -5.58-2.74), with more underestimation in women (mean bias difference of -1.16, P <0.001). No significant age-related measurement bias differences between PAC and EDM were noted. Significant reductions in lactate and norepinephrine requirement were noted following EDM monitoring periods. Conclusions : This study found that the EDM significantly underestimated cardiac output in women when compared to PAC. Clinicians should be aware of this measurement bias when making therapeutic decision based on EDM data. Significant reductions in lactate and norepinephrine requirement during EDM monitoring periods support the clinical usefulness of EDM technology. Background : Smear-negative tuberculosis occurs more frequently in human immunodeficiency virus (HIV)-infected patients than in non-HIV-infected patients. Besides, there are substantial numbers of patients who cannot produce sputum, making the diagnosis of pulmonary tuberculosis (PTB) difficult. Aims : To evaluate the relative yield of pre- and post-bronchoscopy sputum and bronchoalveolar lavage (BAL) in 'sputum smear'-negative, HIV-positive patients. Settings : A tertiary care referral hospital in Addis Ababa. Materials and Methods : Acid-fast stain (AFS) using the concentration technique was done on 85 pre-bronchoscopy sputum and 120 BAL samples. Direct AFS was done on all BAL and 117 post-bronchoscopy sputum samples. Culture for Mycobacterium tuberculosis (MTB) was done for all sputa and BAL. Results : MTB was isolated from 26 (21.7%), 23 (19.7%) and 13 (15.3%) of BAL, post- and pre-bronchoscopy sputum cultures respectively. AFS on pre-bronchoscopy sputum using concentration technique and direct AFS on BAL together detected 11 (41%) of the 27 culture-positive cases. In patients who could produce sputum, the sensitivity of pre-bronchoscopy sputum culture (13/85, 15.3%) was comparable to BAL (12/85, 14%) and post-bronchoscopy sputum (12/85, 14%). In patients who could not produce sputum, however, both BAL (12/35, 40%) and post-bronchoscopy sputum (12/32, 31.4%) detected significantly more patients than those who could produce sputum ( P =0.002, P =0.028 respectively). Conclusion: In HIV-infected patients, AFS by concentration method on pre-bronchoscopy sputum and direct AFS on BAL in patients who cannot produce sputum are the preferred methods of making a rapid diagnosis. BAL culture seems to add little value in patients who can produce sputum; therefore, bronchoscopy should be deferred under such circumstances. Background and Objectives : Genetic studies suggest that the sickle cell mutation has arisen on at least four separate occasions in Africa and as a fifth independent mutation in the Eastern Province of Saudi Arabia or India. The pathophysiology of sickle cell disease (SCD) is essentially similar in these different areas although the frequency and severity of complications may vary between areas. The aim of this study was to evaluate the prevalence and outcome of acute chest syndrome (ACS) in SCD patients from Eastern province of Saudi Arabia in comparison with patients with African haplotypes. 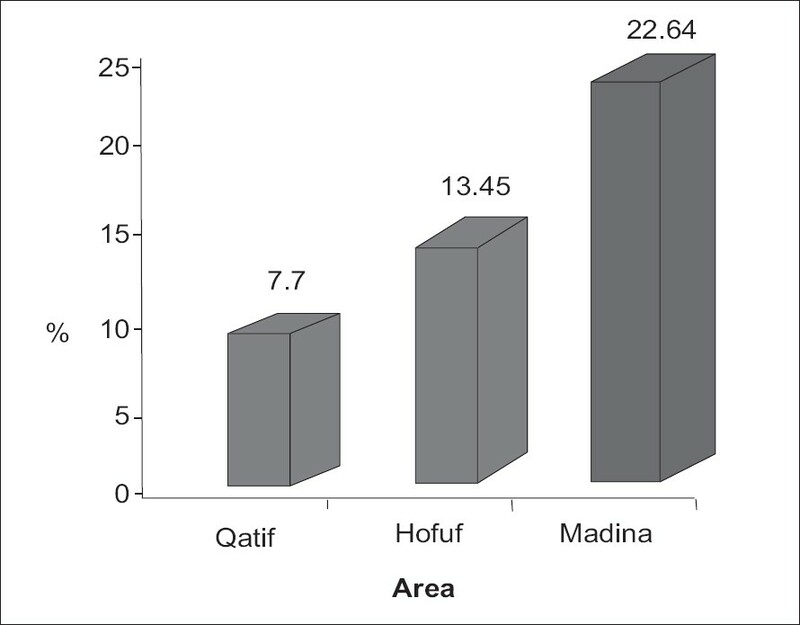 Materials and Methods : This was a retrospective study involving 317 SCD patients who were two years or older, admitted to King Fahad Hospital Hofuf between January-May 2003 for different etiologies. Twenty six patients presented with different causes of ACS; 11 patients presented with different pathologies other than ACS, but had past history of ACS; 280 patients presented with different pathologies and never presented with ACS. Clinical features, CBC, Hb-electrophoresis, G6PD activity, cultures, chest X-ray, arterial oxygen saturation, blood transfusion rates and outcome were studied. Univariate and multiple regression analysis were carried out to evaluate influence on ACS. Comparison between SCD patients with ACS from this study and from Eastern province of Saudi Arabia to patients with African haplotypes were carried out, using data reported in the literature. Results : During the period of this study, 37 patients with new or previous episodes of ACS were studied (accounting for 11.67% of admitted SCD patients). Most of the patients with ACS had only one episode, but five patients (13.51%) had had episodes or more. One patient died giving an in-hospital mortality rate of 1/26 (3.85%). Comparison of recurrence of ACS and mortality between SCD patients in Eastern province of Saudi Arabia to that of patients with African haplotype showed that recurrence is significantly lower ( P <0.025) in patients from Eastern province compared to patients with African haplotype, mortality also is lower but not statistically significant. Conclusion : Acute chest syndrome in SCD patients in Eastern province of Saudi Arabia is relatively uncommon, but causes significant morbidity and mortality. Its prevalence and recurrence is low if compared to that of patients with African haplotypes. Pneumonia is a serious complication of varicella infection in adults. This study investigates the clinical characteristics in 19 patients admitted to our hospital with diagnosis of Varicella pneumonia . Materials and Methods : A retrospective chart review study was performed in adult patients admitted with diagnosis of Varicella pneumonia over 13 years (1992-2005). The study documented the clinical characteristics, laboratory investigations, hospital course, complications, treatment received and the outcomes. Results : Nineteen patients were identified with a mean age of 41 (±15.4). All were males except two. Eleven patients (58%) were smokers. Eleven patients (58%) had direct contact with persons with chickenpox infection. One patient had underlying chronic pulmonary disease (sarcoidosis). Sixteen patients (84%) were admitted to the intensive care unit due to respiratory failure; eight of them required mechanical ventilation. The mean duration of ICU stay was 4.4 days. All patients were treated with acyclovir and IV antibiotics. Three patients received IV steroid. There was one death. Conclusion : Patients with Varicella pneumonia are at high risk for respiratory failure and the need for mechanical ventilation. However, early implementation of supportive therapy seems to positively influence the recovery rate and outcome. Introduction: The goal of this study was to investigate the short-term outcomes in patients older than 60 years with isolated rib fractures and admitted to emergency hospital. Materials and Methods: This study included patients who were 60 years old or more and sustained blunt chest injury and had isolated rib fractures. The following data were obtained from the medical records: age, gender, number of fracture ribs, side of fracture ribs, mechanism and nature of injury, preexisting medical conditions, complications, admission to intensive care unit (ICU), need for mechanical ventilation, length of ICU and hospital stay and mortality. Results: For the study, 39 patients who were 60 years old or more and admitted to the hospital because of isolated rib fractures were enrolled. There were 28 males (71.7%) and 11 females (28.3%) with mean age of (66.84 ± 4.7) years. No correlation was found between comorbidities and hospital outcomes except in those who were diabetic (P-value = 0.005) and those with chronic lung disease (P-value = 0.006). Pulmonary complications were the most frequent complications encountered in those patients. Pulmonary complications were: lung contusion in 8 patients (20.5%) and pulmonary infection in 6 patients (15.8%). Conclusion: Elderly patients sustaining blunt chest trauma had significant morbidity and potential for mortality. Pulmonary tumor thromoembolism is well described in literature especially in patients known to have cancer. We are presenting this report of a patient presenting with Acute Cor-pulmonale secondary to Occult Gastric carcinoma causing pulmonary tumor embolism. This is an unusual presentation of occult neoplasm. 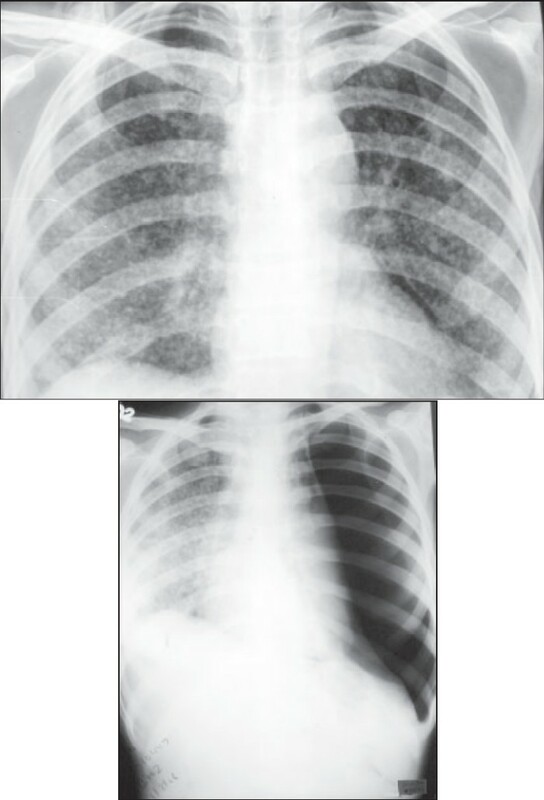 Pneumothorax due to mycetoma is extremely rare and has been described only in patients undergoing intensive cytotoxic therapy for hematologic malignancies. 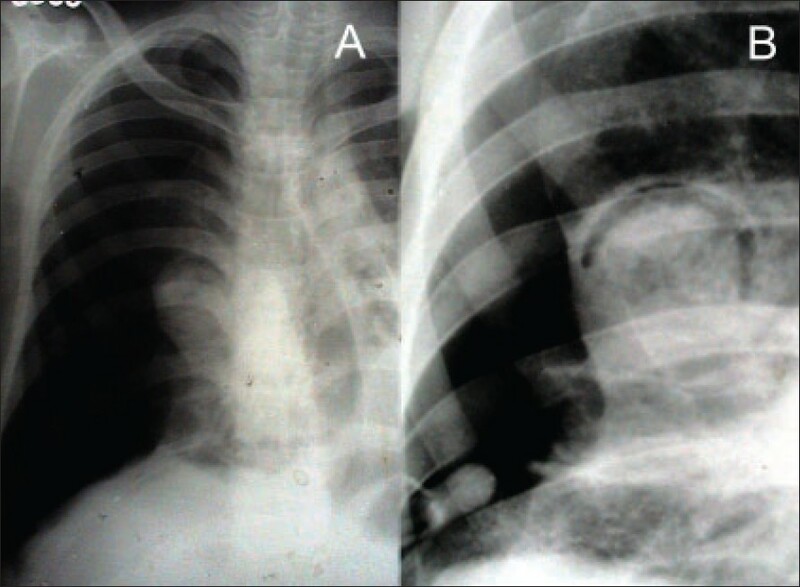 A non-immunocompromised subject presenting with pneumothorax due to rupture of the mycetoma into the pleural cavity is being described here. Despite the fact that miliary tuberculosis is frequently seen, associated pneumothorax developing during antitubercular chemotherapy for miliary tuberculosis is rare. 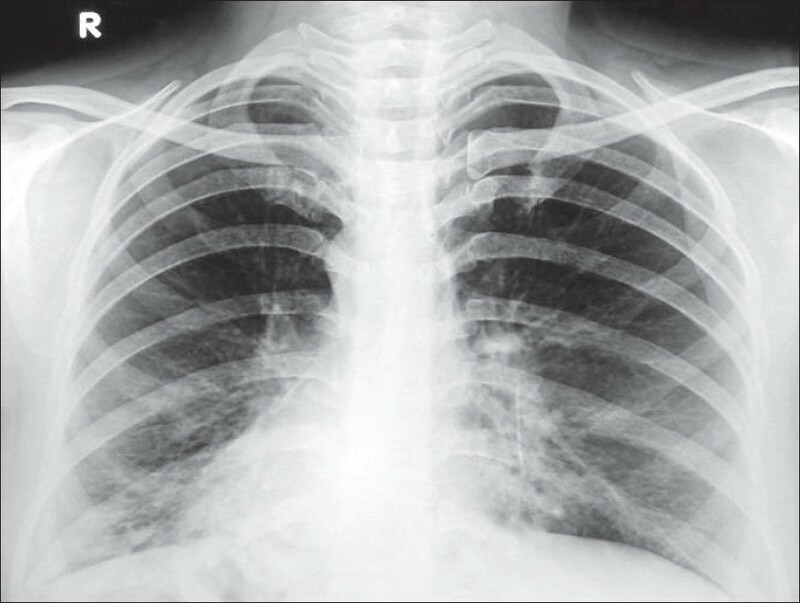 Pneumothorax is potentially life threatening in association with miliary tuberculosis; and its symptoms may be masked by those of miliary tuberculosis, leading to avoidable delay in the diagnosis of pneumothorax. Here we describe a 24-year-old female patient developing recurrent pneumothorax while on antitubercular chemotherapy for miliary tuberculosis. Airway pressure release ventilation was introduced to clinical practice about two decades ago as an alternative mode for mechanical ventilation; however, it had not gained popularity until recently as an effective safe alternative for difficult-to-oxygenate patients with acute lung injury/ acute respiratory distress syndrome This review will cover the definition and mechanism of airway pressure release ventilation, its advantages, indications, and guidance.